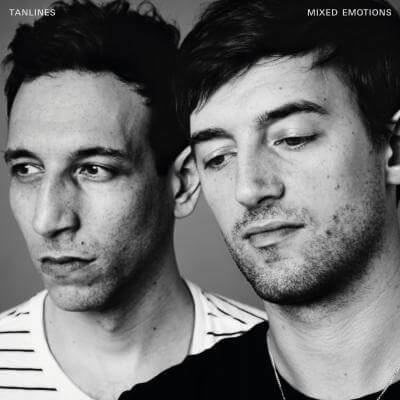 Mixed Emotionsis the debut album from Brooklyn’s Tanlines, the duo of Eric Emm (vocals, guitar, keyboards) and Jesse Cohen (drums, keyboards, bass). Initially a production project, Tanlines have evolved through two acclaimed EPs into a deeply personal, electronic pop group. The album was recorded in a series of locations after the band were evicted from their own studio, which in turn pushed Emm to focus on his lyrics and songwriting. In the process, he discovered a beautiful baritone vocal style. The lyrics poured out of him, and their maturity and honesty form the core of Mixed Emotions. Legendary engineer Jimmy Douglass (Timbaland, Aaliyah, Television, Missy Elliot) mixed the album in Miami. The result fuses the music of the band’s childhood (New Order, the KLF, Stock Aitken Waterman, Stevie Winwood) with pristine synthetic sounds and their own homespun organic ones.